Ravenshire Castle is a new castle building and adventure Facebook game by 6Waves, based on the successful series of Ravenwood Fair or Ravenskye City. Actually if you ever played any of the mentioned titles you will immediately recognize the graphics and characters distinctive looks. You start by choosing your character, and find you are the heir and now ruler of the ruined Ravenshire Castle, your mission is to rebuild and restore its glory, this is done by following the several quests given to you by your loyal servant and guide, Sebastian the turtle. 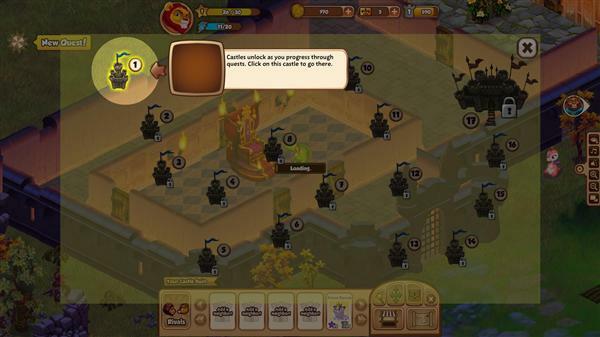 Initial tasks will require you to restore you castle by steps, starting with one division by quest, these are the usual point a click to complete, or buy necessary items in the store. For example you start by restoring your throne room, by clicking in it and adding some torches that you can buy. Ravenshire Castle gameplay revolves around this tasks, but each one follows the story and offers some kind of background, you have to breed magical pets like cute little dragons or plant crops, much like in CastleVille you also have to clear the land to be able to expand your castle, and at the same time collect resources to support your building plans, the main ones are rock and wood. Besides this building management side, which basically brings nothing new, there is a new feature which is actually quite interesting, where you can sneak into your friends castles to search for resources and rewards. This introduces a sort of player vs player style into the game and gives players the chance for some strategic planning. There are to types of sneak missions, one is story driven, you have a map with several NPC castles to ride, which usually come with quests and specific rewards, for example your first sneak mission is to rescue Rosamunde the Gardener from Baron Brak’s castle, in return she will become your gardener and help out in your castle. 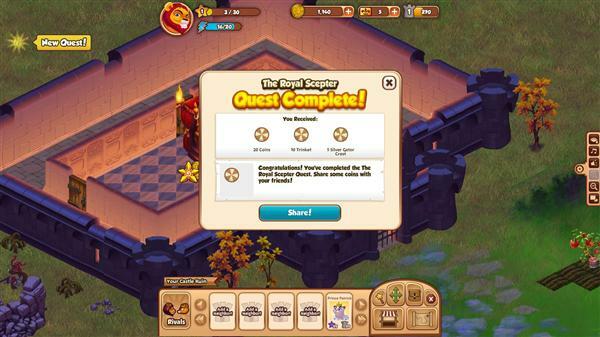 This section currently offers 17 castle to ride, progressively unlocked by quests. You can also just sneak into other players castles, in PVP mode, in both modes you have to search available items, like decorations, torches and treasures for rewards, while avoiding the several characters roaming around the castle. The more rooms and hall the castles have, the more difficult it will be to move around, so this bring another strategic question, how to prevent or make it difficult for other to sneak into yours? You do this by spacing your rooms, placing more hall and corridors between them, but in order to do this you need more empty space, which will requires you to clear more rocks and trees, which cost energy, etc, etc… You can then recruit guards amongst your friends and place them strategically to be more efficient in their function. Ravenshire Castle uses several ranking or grading systems, there is your castle Rank, that measures your castle achievement, you raise this by adding decorations, rooms and other items to your castle. Then there is your level, you raise it by doing quests and earning experience, it will allow you to unlock new quests and progress in the game. There is also the sneak rank, this measures you sneaking activity and progress on the campaign map. Finally there is the rivals leader board where you can compare sneaking with other players. Related Tags: 6Waves, adventure, city building, pvp. ← Conquer Online 9th Anniversary Begins, New Free Trip to China!